In a few weeks’ time, it will be a year since our world was turned upside down (writes mum Yvonne). Our daughter, Annabelle, was seriously unwell in hospital, she had an enterovirus and acute encephalitis. Within a few days she went from being a normal four-year-old girl to being fully paralysed, tube fed and very very sick. The virus attacked her spinal cord and the encephalitis attacked her brain. Her prognosis was not great. She spent weeks in hospital getting intensive physiotherapy and speech and language therapy to learn how to walk, talk and eat again. It has been a pretty tough year with many ups and downs. Annabelle has a long way to go but has fought hard to get to where she is today. We decided to get a photo shoot done to mark the occasion. 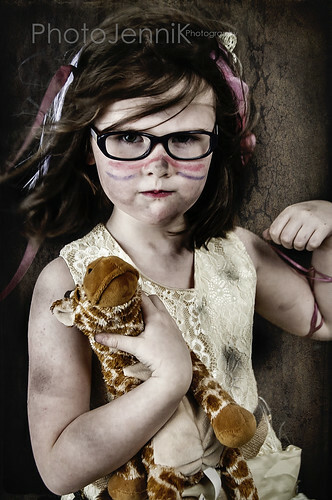 We chose to have a warrior theme to represent the fight that Annabelle and others with similar illnesses go through. It is not easy to rebuild your life after something like this, Annabelle and her sister Bethany are both warriors in our eyes. Feeling very privileged to be part of this moment with them. Both amazing girls! Yvonne approached me a couple of weeks ago with her idea for the shoot and I understood her vision straight away and suggested a few bits and pieces of clothing to help make the vision a reality. I wanted the shoot to be fun for the girls so we had a wee dressing up in tutus etc. first. I wanted to show both sides of the girls in the images. Then we got stuck into the war paint and messing them up a bit. It was great fun and I got so much from the girls, they did exactly what was asked. Annabelle in particular was killing it with her fierce eyes and strong body language! I’m really pleased with the image pf both girls as it shows strength and unity. Annabelle’s stance suggesting she won’t be surrendering and Bethany saying “bring it on”!